Who Owns the US Debt Held by the Public? Persistent federal budget deficits have contributed to the burgeoning US debt. This chart uses data from the United States Treasury to break down ownership of the debt held by the public, which currently amounts to $11.9 trillion. In 2000, foreign investors held roughly half as much debt as domestic investors; today, foreign governments and investors hold about half of the almost $12 trillion of US public debt. Governmental entities, like the Federal Reserve and state and local governments, hold the next largest share, at 21 percent. 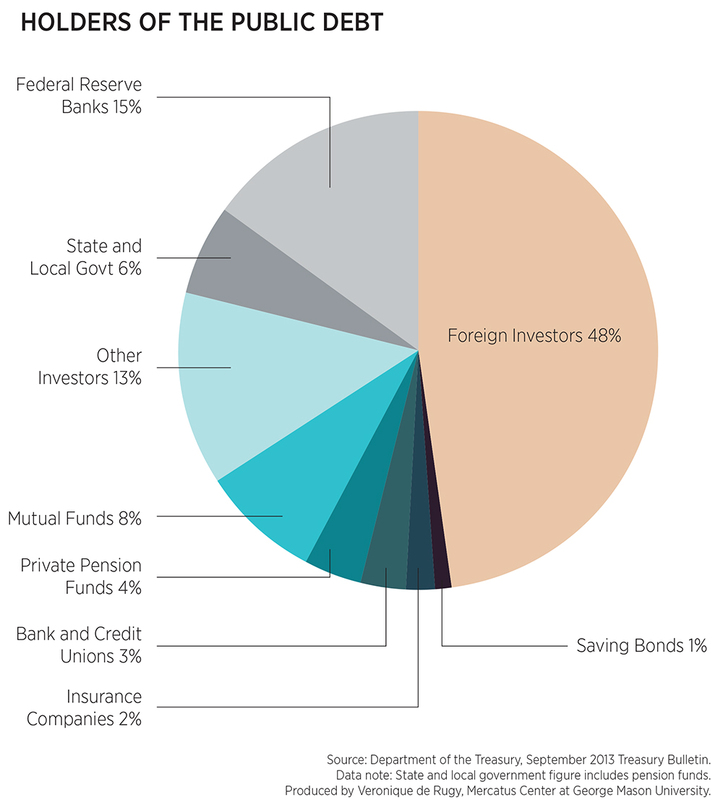 Private institutional investors, like mutual funds and pension funds, hold 13 percent. The remaining 16 percent is spread out among domestic banks, businesses, and individual investors. Continued borrowing, whether domestically or abroad, to finance increased spending on entitlements, the main drivers of debt, ultimately increases the eventual burden on US taxpayers, who will have to pay for it. How Much of the Government Is Actually Shut Down?